Advertise goods, services, or some specific information. For example, enterprises need to launch a new product, provide new services, or to advertise the promotion of certain product information. The design of the poster will emphasize the brand of the enterprise, so that the enterprise brand can quickly get the attention of passers-by. Enhance the corporate image which is conducive to enterprise brand building. This role to distinguish the part of brand awareness is the poster of the corporate brand logo can be achieved, but corporate image and brand building needs to be from the content of the poster to make a fuss. I have reviewed some of the principles that how to make a successful poster. 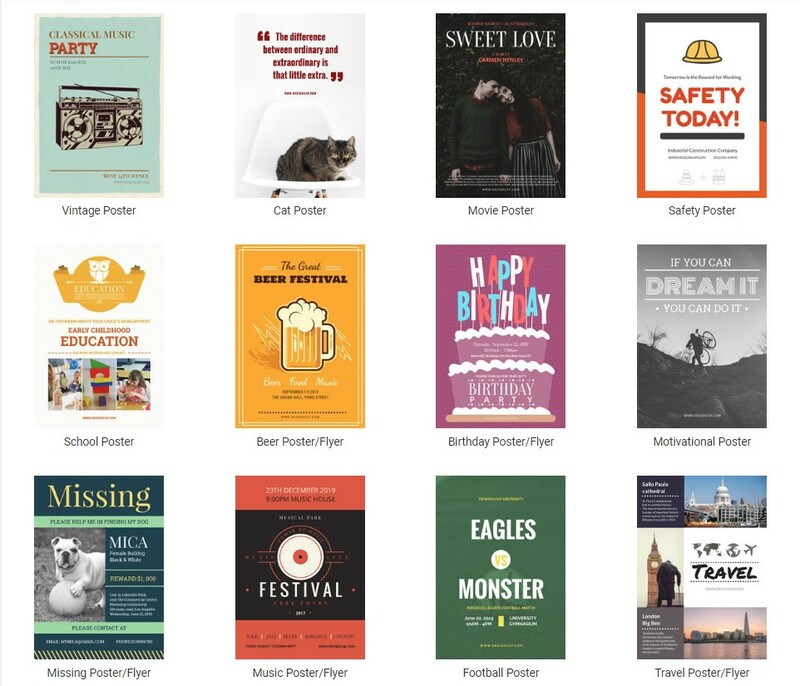 Generally speaking, the main reason for a success of poster is based on practicability, such as supermarket shop celebration posters which need to protrude shop celebration, clearly hit the main title, subtitle, event time, activity rules, and then added to a few promotional items. Right? It has better to be simple and clear, do not blindly to pursue the high force. The pace of life is fast. Consumers don’t have enough time to speculate, to read and enjoy the posters. Today, posters do not need to be handed over to a third party or use a simple word processor program to make posters from scratch. You can use simple poster making tools which provide you with various types of templates. As they say, time is money. All you need to do is select one of the templates and change its default information to your own. Then you have a professional poster. That’s how simple it is to design eye-catching posters. One of the first solutions that I suggest you try to make free online posters directly is DesignCap: https://www.designcap.com/. It is an excellent tool in terms of simplicity and easy-to-use. Once you’ve entered its homepage, you just need to click on the Orange Start button and you’re on the edit page. Then there’s a toolbar in the upper-left corner which includes filtering templates, uploading photos, adding fonts, inserting icons, and changing background colors. Based on the template you choose, you can easily customize its font plates, color schemes, graphic combinations and more. All templates are free to use. The only drawback may be that the number of template updates is not enough at the moment, but I think it also allows you to meet your usual needs. Make it easy for you to make a professional and eye-catching poster. If you do not want to “overfill” your computer by installing all kinds of poster-making programs, instead, are looking for a tool which is easy to share on social networking sites and download. Why not try DesignCap? All in all, thanks to these online tools provide the predefined templates just like this resume templates so that we don’t need to start from scratch, saving us a lot of time and energy. Instead of turning into a specialized third party, would you prefer to use an online tool to design posters by yourself?